The Yellowstone Cutthroat trout is currently ranked "S2" in Montana because it is at risk because of very limited and/or potentially declining population numbers, range and/or habitat, making it vulnerable to extirpation in the state. The Yellowstone Cutthroat Trout is one of two cutthroat trout subspecies in Montana. They have a golden coloration and larger spots more widely distributed on their sides than the Westslope Cutthroat Trout. The Yellowstone Cutthroat, as the name implies, is native to the Yellowstone River drainage of southwest and south-central Montana. Originally their range was as far downstream as the Tongue River, but today pure, unhybridized populations are limited to some headwaters streams and Yellowstone National Park. 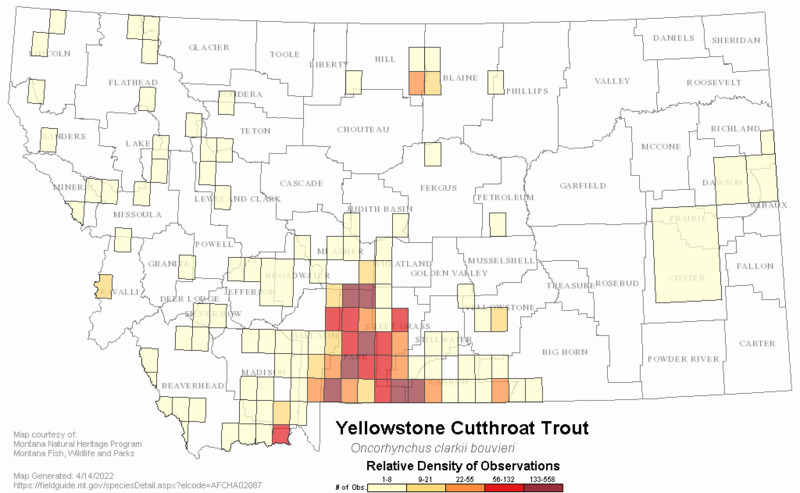 Yellowstone Cutthroat Trout are a Montana Fish of Special Concern. Much of their spawning habitat in tributaries of the upper Yellowstone River has been lost to irrigation withdrawals which dewater the streams before spawning and egg-incubation are completed in July and August. The Big Timber hatchery of the Montana Department of Fish, Wildlife, and Parks maintains a pure Yellowstone Cutthroat broodstock. Yellowstone Cutthroat Trout are used extensively for mountain lake stocking on the east slope of the Rocky Mountains and in the Absaroka-Beartooth Wilderness where they can grow to sizes up to 15 pounds. In general, Yellowstone Cutthroat Trout are larger than Westslope Cutthroat Trout and more prone to eat fish as part of their diet. The Yellowstone Cutthroat Trout is visually distinguished from other trout species by its two prominent red slashes on the lower jaw, and from other cutthroat trout subspecies by its medium-large, black spots that tend to be concentrated posteriorly, and its drab brownish, yellowish, or silvery coloration, with brighter colors generally absent even in mature fish (Behnke 1992, Baxter and Stone 1995, Montana AFS Species Status Account). Tiny teeth are usually present on the floor of the mouth behind the tongue. These are embedded in tissue and difficult to see but may be felt if brushed with the side of a needle. Red on the side of the head and gill cover becomes intense in the breeding male. 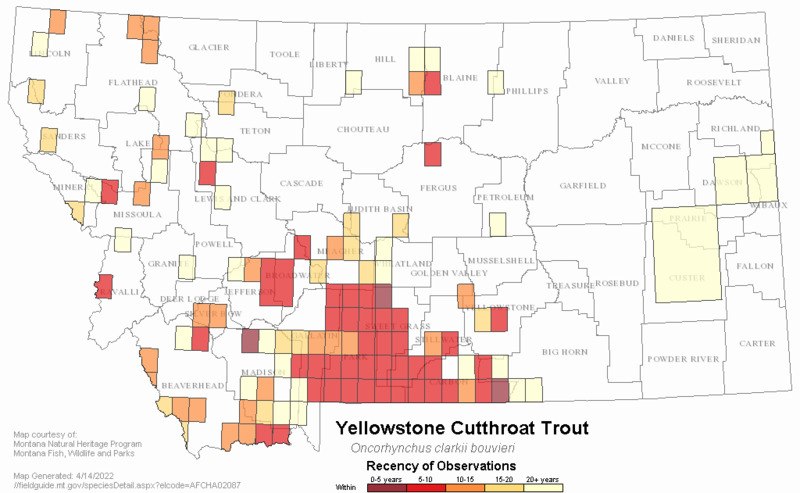 Historically, Yellowstone cutthroat trout were believed to have occupied much of the Yellowstone River basin, including portions of the Clarks Fork of the Yellowstone River, Bighorn River, and Tongue River basins in Montana and Wyoming, and parts of the Snake River basin in Wyoming, Idaho, Utah, and Nevada. This species has been introduced to many watersheds in Montana where they were not native. Yellowstone Cutthroat Trout inhabit relatively clear, cold streams, rivers, and lakes. Optimal temperatures have been reported to be from 4 to 15 degrees C., with occupied waters ranging from 0 to 27 degrees C. (Gresswell 1995, Montana AFS Species Status Account). Yellowstone Cutthroat Trout may live as long as 11 years (Gresswell 1995, Montana AFS Species Status Account). There are three primary life history patterns: resident, fluvial, and adfluvial (Gresswell 1995). Resident fish occupy home ranges entirely within relatively short reaches of streams. Fluvial fish migrate as adults from larger streams or rivers to smaller streams to reproduce. Adfluvial fish exhibit a similar pattern, but migrate, sometimes many kilometers, as mature adults from lakes to inlet or outlet streams to spawn (role of stream ice on fall and winter movements and habitat use by Bull Trout and cutthroat trout in Montana headwater streams). Movement in Yellowstone Cutthroat Trout may also be associated with temporal habitat changes. At low water temperatures in winter, fry (and probably juvenile) Yellowstone Cutthroat Trout entered spaces in the stream bottom during the day, and emerged from them at night (Griffith and Smith 1993). Larger Yellowstone Cutthroat Trout may also shift habitats from fall to winter as water temperature declines and anchor and shelf ice develop (Brown and Mackay 1995, Jakober et al. 1998). Yellowstone Cutthroat Trout probably undergo localized movements associated with changes in habitat or food availability in other seasons (Young 1996, Young et al. 1997, 1998, Montana AFS Species Status Account). Yellowstone Cutthroat Trout typically spawn in spring and early summer after flows have declined from their seasonal peak and tend to select sites with suitable substrate (gravel less than 85 mm in diameter), water depth (9 to 30 cm), and water velocity (16 to 60 cm per second) (Varley and Gresswell 1988, Byorth 1990, Thurow and King 1994). Water temperature determines the time of hatching and emergence of fry. After emergence, fry immediately begin feeding, typically in nearby stream margin habitats, but they may also undertake migrations to other waters (Gresswell 1995). Juvenile fish require three or more years to mature. Spawning fish tend to be from 200 to over 600 mm long and weigh from 0.1 to 5 kilograms (Thurow et al. 1988, Montana AFS Species Status Account). To maintain healthy populations of Yellowstone Cutthroat Trout and to ensure the wide-ranging persistence of this subspecies in Montana and elsewhere, a number of tactics have been proposed in recent status assessments (Yellowstone Cutthroat Trout Working Group 1994, Gresswell 1995, May 1996, May et al. 1998, Dufek et al. 1999, Wyoming Game and Fish Department 2000). These include field surveys, harvest management, habitat protection and improvement, non-native species control, and broodstock management (Montana AFS Species Status Account). Gresswell (1995) and Kruse et al. (2000) considered nonnative fish species the greatest threat to the persistence of Yellowstone cutthroat trout. Because Yellowstone cutthroat trout and rainbow trout readily hybridize and produce fertile offspring, sympatric populations often form hybrid swarms (Allendorf and Leary 1988; Henderson et al. 2000). Introductions or invasions of brown trout Salmo trutta, brook trout Salvelinus fontinalis and Lake Trout (Yellowstone Lake) have led to displacement of cutthroat trout throughout the western U.S.
Baxter, G. T. and M. D. Stone. 1995. Fishes of Wyoming. Wyoming Game and Fish Department, Cheyenne, Wyoming. 290 pp. Byorth, P. A. 1990. An evaluation of Yellowstone cutthroat trout production in three tributaries of the Yellowstone River, Montana. M.S. thesis. Montana State University, Bozeman. Gresswell, R. E. 1995. Yellowstone cutthroat trout. Pp 36-54 In: M. K. Young, technical editor. Conservation assessment for inland cutthroat trout. USDA Forest Service Gen. Tech. Rep. RM-GTR-256. iv + 61 pp. Griffith, J. S. and R. W. Smith. 1993. Use of winter concealment cover by juvenile cutthroat and brown trout in the South Fork of the Snake River, Idaho. North American Journal of Fisheries Management 13(4): 823-830. Jakober, M. J., T. E. McMahon, R. F. Thurow, and C. G. Clancy. 1998. Role of stream ice on fall and winter movements and habitat use by bull trout and cutthroat trout in Montana headwater streams. Transactions of the American Fisheries Society 127 (2): 223-235. May, B. E. 1996. Yellowstone cutthroat trout. Pp 11-34 In: D. Duff, editor. Conservation assessment for inland cutthroat trout: distribution, status and habitat management implications. U.S. Forest Service, Northern, Rocky Mountain, Intermountain, and Southwestern Regions. May, B. E. et al. 1998. Yellowstone cutthroat trout conservation program within the state of Montana. Prepared for the Montana Department of Fish, Wildlife and Parks, Helena. Thurow, R. F. and J. G. King. 1994. Attributes of Yellowstone cutthroat trout redds in a tributary of the Snake River, Idaho. Transactions of the American Fisheries Society 123: 37-50. Thurow, R.E, C.E. Corsi, and V.K. Moore. 1988. Status, ecology, and management of Yellowstone cutthroat trout in Upper Snake River Drainage, Idaho. American Fisheries Society Symposium 4:25-36. Varley, J. D. and R. E. Gresswell. 1988. Ecology, status, and management of the Yellowstone cutthroat trout. American Fisheries Society Symposium 4:13-24. Young, M. K. 1996. Summer movements and habitat use by Colorado River cutthroat trout (Oncorhynchus clarki pleuriticus) in small, montane streams. Canadian Journal of Fisheries and Aquatic Sciences 53(6): 1403-1408. Young, M.K., K.A. Meyer, D.J. Isaak, and R.A. Wilkison. 1998. Habitat selection and movement by individual cutthroat trout in the absence of competitors. Journal of Freshwater Ecology 13: 371-381. Darling, J., et al. 1992. 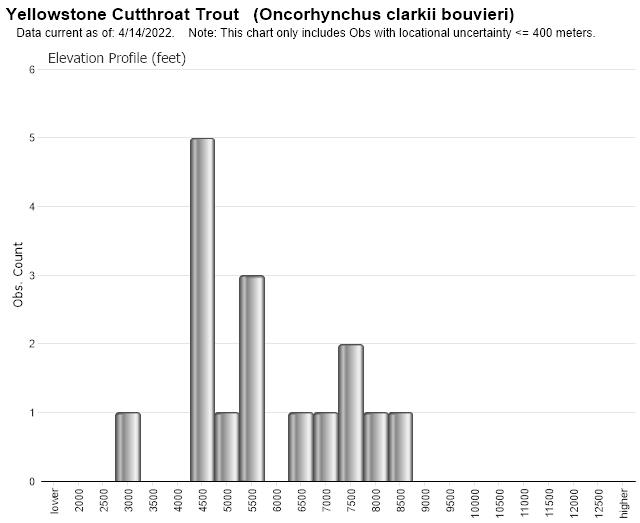 Yellowstone cutthroat trout (Oncorhynchus clarki bouvieri) management guide for the Yellowstone River drainage. [technical report]. Yellowstone Cutthroat Trout Working Group. 25 pp. Gresswell, R. E. and J. D. Varley. 1988. Effects of a century of human influence on the cutthroat trout of Yellowstone Lake. Amer. Fish. Soc. Symposium 4:45-52. Web Search Engines for Articles on "Yellowstone Cutthroat Trout"